Samsung on Thursday announced its main competition for this fall's iPhones in the form of the Galaxy Note 9, the latest version of the smartphone often credited for popularizing "phablet" sizes. The U.S. version of the new phone has a faster Snapdragon 845 processor, a 6.4-inch 2960x1400 OLED display, and louder AKG speakers. Other improvements include a larger, "all-day" 4,000 milliamp-hour battery, and an upgraded S Pen with Bluetooth support. The stylus can be used to do things like trigger photos, control slideshows, and play and pause videos. The phone also supports Samsung's desktop-style DeX mode without a separate dock. Further making it a potential desktop replacement is an option of 128 or 512 gigabytes of internal storage, which can be supplemented by an upcoming 512-gigabyte micro SD card to hit 1 terabyte of space. Apple's iPhone X tops out at 256 gigabytes of storage. 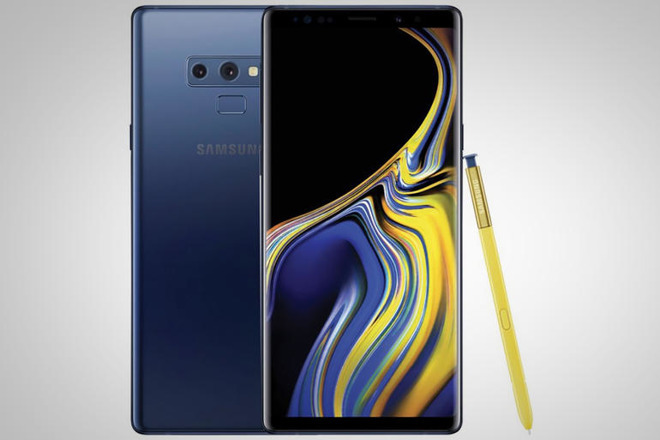 The Note 9 is otherwise a modest evolution of last year's Note8, including previous features such as USB-C, dual rear cameras, a headphone jack, and a front-facing iris scanner. Samsung has however responded to complaints and moved the fingerprint reader from the side of the rear camera module to below it, making it easier to reach while reducing accidental lens smudges. The phone's "Intelligent Camera" has the same specifications as the Note 8, but can alert people to flaws in images such as closed eyes, and will automatically optimize output in many cases based on scene and object detection. The product should launch Aug. 24 in four colors, with preorders starting Aug. 10. The 128-gigabyte model will cost $999, while the 512-gigabyte version will be $1,249. Apple is expected to premiere three new iPhones this fall, including 5.8-inch OLED and 6.1-inch LCD models. The most direct competition to the Note9 should be a 6.5-inch OLED model, sometimes nicknamed the "iPhone XS Plus." There's no indication however that Apple plans to offer a first-party stylus for it.